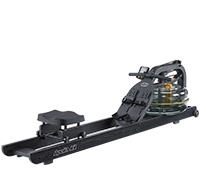 The Horizon rowing machine Oxford 5 features a perfect quality and is one of our absolute price-performance tips regarding rowing machines! The rowing machine Oxford 5 is equipped with a silent air resistance system. It allows a smooth rowing movement like on water. Determine the training intensity individually by controlling the pulling resistance by your stroke power. The rowing machine Oxford 5 also convinces by its special comfort. The ergonomically shaped ERGO COMFORT rowing seat oofers a very thick upholstery and slides very smoothly via the lon aluminium rail. It makes the Oxford 5 also interesting for taller persons by allowing a full course of motion. The rower handle (42 cm wide and encased with plastics) is optimally adapted to the hand anatomy and is well to grasp. Another advantage of the Oxford 5 rowing machine is its space-efficient storage. Thanks to the well-thought out folding mechanism and the integrated transport wheels, the rowing machine is easy to store. 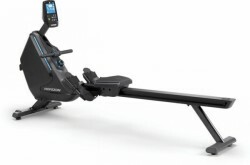 The rowing machine Oxford 5 is equipped with a training computer adjustable in incline. The clear LCD display informs about important training data like time, number of strokes, strokes per minute/stroke rate, time/500m, pulse, calory consumption, distance, performance, and Watt. For a varied workout, the Oxford 5 offers you different training programs: manual, race against the computer, heart rate function and recovery work only in combination with an optional chest strap transmitter.